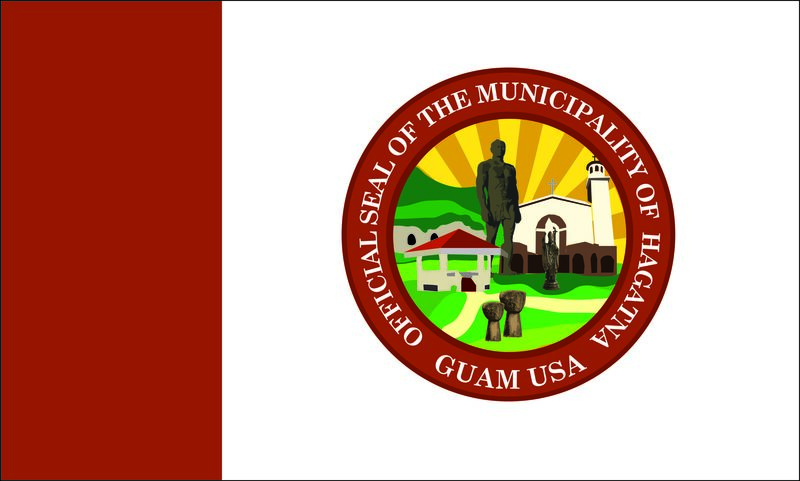 When were these flag designs of Guam’s municipalities created? 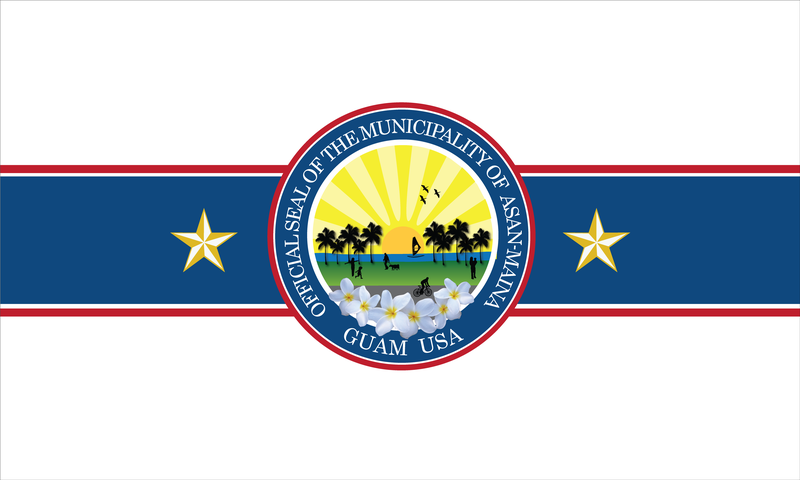 These flag designs of Guam’s municipalities were created in 2010 and 2011, but adopted unofficially in late 2011. What was the impetus for coming up with designs for Guam’s municipalities? The Mayors’ Council of Guam received funds from the Guam Visitor’s Bureau as part of the “We are Guam” marketing effort. The council approved the use of funds to obtain professional design services outlining requirements that would ultimately create municipality flag designs that depict the cultural and iconic significance of each village. Are these flag designs eternally fixed as the representative design of the municipality? It is the position of the Mayors’ Council that these designs can remain or change based on the ultimate decision of the mayor in office at the time. Design improvements and suggestions ultimately will be decided by each office itself. How can I affect change on a design that I would like to see? Make your voice heard by contacting your village mayor and advising him or her of your design suggestions, or leave a comment right here on this blog site of your specific flag design of interest. Your mayor or their representative may get wind of your comment and take note of it for future design improvements. Can I save a copy of these flags for use in a commercial or non-commercial project? This blog is to be used to share the various flags of the U.S. Territory of Guam and its municipalities in order to educate and inform those interested in the flags that represent the culture and the history of this American territory in the Northwest Pacific. Guam Code Annotated 2000, §1031. Municipal Flags – Reads that the various Municipal Planning Councils of the Territory may adopt an official municipal flag which depicts the history and culture of the respective village. The Chairmen of the Municipal Planning Councils shall notify the Compiler of Laws of the selection and description of the flag. The municipal flags may be reproduced for official purposes in smaller or larger sizes. 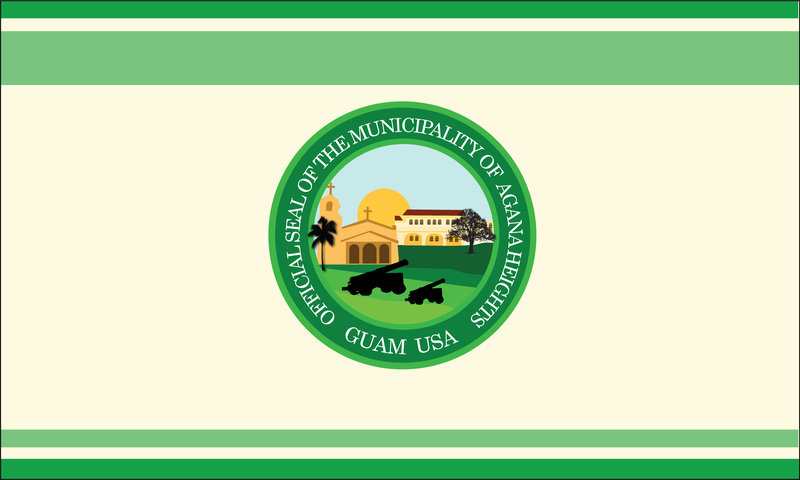 As a result of the above Guam Statute the Mayors’ Council of Guam has been working to design flags for each of Guam’s municipalities based on unique cultural aspects and landmarks that are specific to each municipality. This blog will be the unofficial website for the publishing of all of Guam’s 19 municipality flags to be represented here. In July 1917, Roy Smith, the Naval Governor of Guam at the current time, approved the design of the Guam flag which was designed by Mrs. Helen L. Paul. That same year the flag was officially adopted and the Guam flag would be flown together with the American flag wherever the American flag was located on the island of Guam. 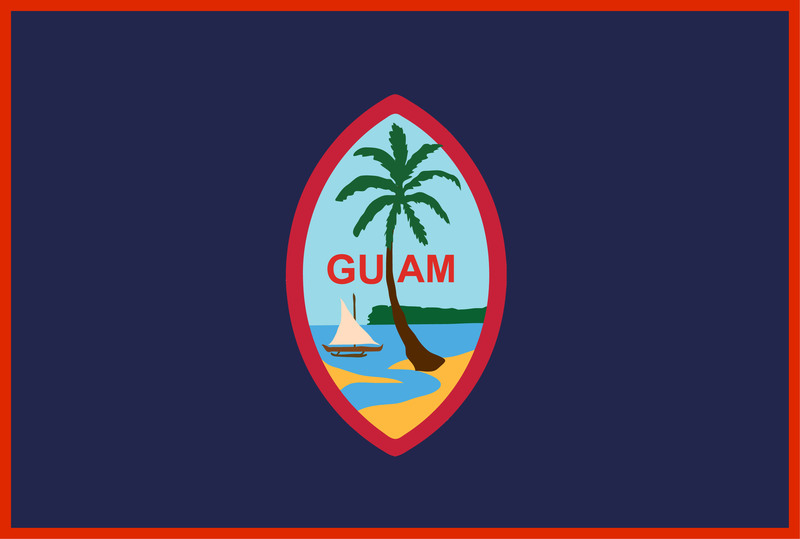 The design of the Guam flag consisted of a rectangular field of deep blue color with a red border, and having at its center the Guam coat of arms which was oval-shaped and consisted of a proa, or sailing canoe, a palm tree, and the cliff line of Two Lover’s Point in the background. The Guam flag made its first appearance at an industrial fair in 1917 at the Plaza de Espana in Hagatna. It was officially accepted by the Guam Congress in 1950. A great typhoon of 1918 left one coconut palm standing at the mouth of the Hagatna River, recreating the scene on the flag. In 1930 the oval design in the center of the Guam flag was officially made the Great Seal of the Territory of Guam. Hagatna, formerly know as Agana, is the island’s capital and one of nineteen municipalities of the U.S. Territory of Guam. Hagatna’s flag design sports images of the beautiful landmarks found throughout the capital. The images include the Guam’s golden rising sun, its lush rolling hills, rugged limestone cliffs, and dark cold caves where Japanese soldiers hid during World War II. Additionally, Chief Quipuha, the ancient village Chief of Hagatna, who ruled before and during the European occupation by Spain is also shown. Furthermore, the flag displays the Agana Basillica, which represents the head of the Roman Catholic in Guam. It also shows the Plaza de Espana which represents the long Spanish occupation and its influence on the culture of its people; the latte stones which represent strength and an important element in building architecture pre-war, and the statue of Pope John Paul II that depicts an historic visit to the island in the early 1980s. The flag is richly painted in red depicting the village name, Hagatna, which means “their bloodline”, referring to specific family clans that made this village their home, during pre-war Guam. Note: This flag design has been produced for the Mayors’ Council of Guam. For information regarding official adoption of this flag design, please contact the the Mayors’ Council of Guam directly. Agana-Heights is one of nineteen municipalities on the U.S. Territory of Guam. Agana-Heights’ village flag design promotes several village landmarks known to many long-time residence. The flag’s colors, which are various tones of green, reflect its abundant flora, as well as its deep golden yellow hues, which reflect the sunshine that embraces it. The flag highlights three landmarks that grace this beautiful village overlooking Hagatna. The landmarks include the Catholic church which is the center of religious activity, the governor’s house where dignitaries are hosted, and the Spanish cannons that grace Fort Agueda which are a testament to its Spanish influence. Agat is one of nineteen municipalities on the U.S. Territory of Guam. 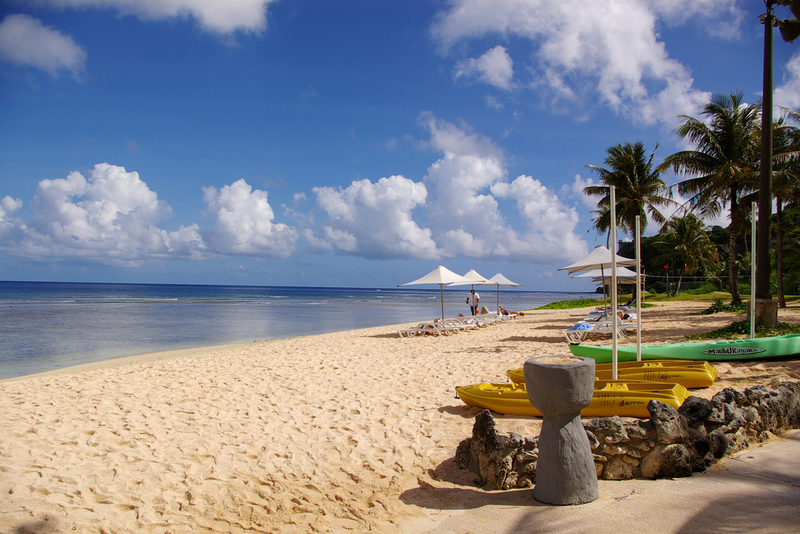 Agat is also known as Hagat by Guam’s natives. 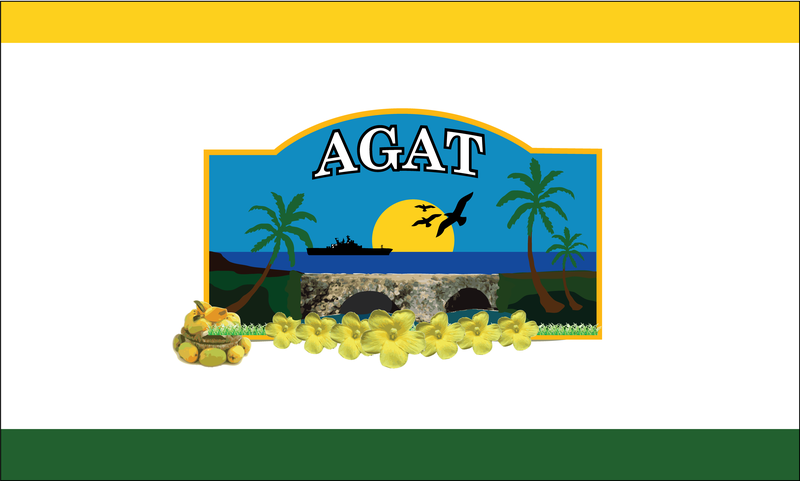 Agat’s flag sports beautiful images of the village set in the colors of blue, green, and yellow. These colors represent the flora of the village, the plentiful sunshine, and clear waters and skies. Silhouettes of birds off-shore, and a military ship in the background display the activity that is commonplace for villagers to see. A basket of mangoes with an abundant harvest is displayed symbolizing the bountiful and giving nature of its rich soil as well as the mango festival held in their village annually. Many yellow Hibiscus flowers symbolize the official village flower displayed in the foreground which highlights the old Spanish bridge which was an historic route to the capital city of Hagatna, Guam. Asan-Maina is one of nineteen municipalities on the U.S. Territory of Guam. The Asan-Maina flag design depicts the relaxed lifestyle of the village, among other things. The design depicts the Asan Memorial War Park, where many island visitors and locals alike make their way to enjoy a stroll in the park, ride bikes, catch some wind and waves in the ocean, and play in the grass. The park, a nationally recognized war park, boasts many coconut trees that make it a picturesque setting, especially when silhouettes are created by Guam’s beautiful setting sun. It is also host to many annual events including an easter egg hunt and a kite flying festival. The flag design bottom center inset displays the village flower, the Plumeria. The flag includes two stars representing Asan and Maina villages. The red strips represents the blood that was shed on the shores of Asan beach during World War II by American soldiers and by the Chamorro people of Guam who were injured and died.